The SREC Registration Program (SRP) is used to register the intent to install solar projects in New Jersey. 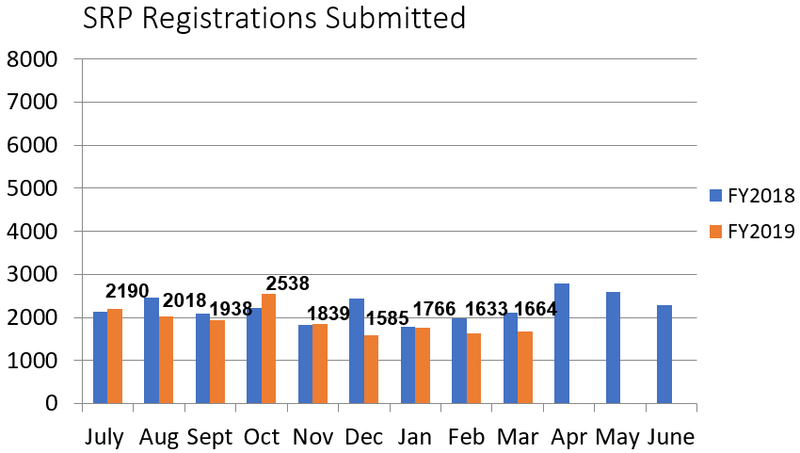 Registration provides market participants with information about the pipeline of anticipated new solar capacity and insight into future SREC pricing. Please note that rebates are no longer available for solar projects. 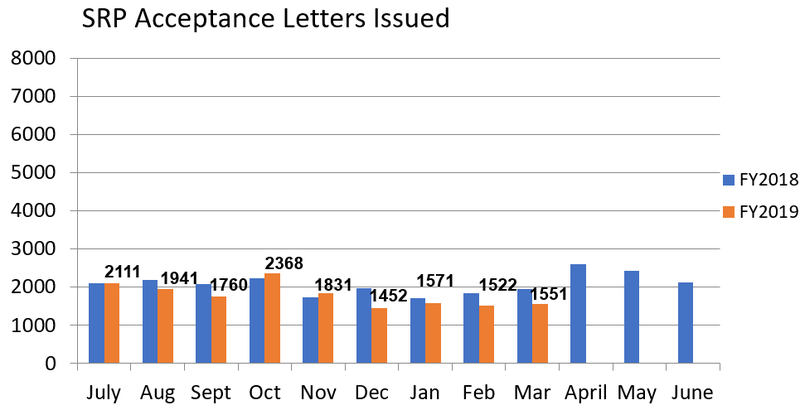 SRP Registrations are being reviewed by the SRP Processing Team within 4-5 days from the date the registration is submitted in the online portal. NJ Certification Numbers are being processed within one week from the date the Final As-Built is submitted. At this time Final As-Built packets submitted through March 25, 2019 are being processed. If you submitted an incomplete Final As-Built packet, the SRP Team is processing deficiencies that were uploaded within 1-2 days. These revisions will be reviewed in the date order they were uploaded into the online portal. How did New Jersey Become a Leader? A strong Renewable Portfolio Standard (RPS) with a dedicated carve-out for solar generated electricity that has helped create sustainable demand and investor confidence in the market. Learn more. Excellent interconnection and net metering standards that have made it easier for projects to connect to the distribution system and be compensated for their contribution. Learn more. A SREC financing model that provides energy certificates and additional long term financing for those who invest in solar. Each time a solar installation generates 1,000 kilowatt-hours (kWh) of electricity, an SREC is earned. Solar project owners report the energy production to the Generation Attribute Tracking System (GATS). This reporting allows SREC’s to be placed in the customer's electronic account. SRECs can then be sold on the SREC Tracking System, providing revenue for the first 10 or 15 years of the project's Qualification Life. 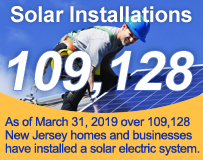 Electricity suppliers, the primary purchasers of SRECs, are required to pay a Solar Alternative Compliance Payment (SACP) if they do not meet the requirements of New Jersey’s Solar RPS. One way they can meet the RPS requirements is by purchasing SRECs. As SRECs are traded in a competitive market, the price may vary significantly. The actual price of an SREC during a trading period can and will fluctuate depending on supply and demand. See recent SREC trading prices. What is the SREC tracking system? All solar energy systems eligible to earn SRECs must report system production based upon readings from a revenue-grade meter that meets the American National Standards Institute (ANSI) Standard C12.1-2008. This meter is in addition to the electric meter installed by the local utility to measure the home or business’ electric consumption. On May 1, 2012, the New Jersey Board of Public Utilities (BPU) re-adopted Chapter 8 rules with amendments that became effective on June 4, 2012. In re-adopting N.J.A.C. 14:8-2.9(c), the Board eliminated the use of production estimates for systems with a capacity of less than 10 kW. The revenue-grade meter must be installed by November 30, 2012. Following that date, SRECs will be issued to systems based only upon readings obtained from a revenue-grade meter measuring the system output. See NJ Administrative Code. Once your solar project has been installed and your online SREC Tracking System account has been established, SRECs will be deposited in your account. The SREC Tracking System also records the sale of SRECs from generators to purchasers. New Jersey's Clean Energy Program uses the SREC Tracking System GATS (Generation Attribute Tracking System), developed and supported by PJM Environmental Information Services (PJM-EIS). Call 866-NJSMART (866-657-6278) for more information on NJCEP or 877-750-GATS (4287) for information on the PJM-EIS SREC Tracking System.